Abstract: Malignant mixed ovarian germ cell tumors are very rare, accounting for ~5.3% of all malignant ovarian germ cell tumors (MOGCTs), with a very high degree of malignancy. The treatment of patients with persistent, refractory, or platinum-resistant MOGCT is not well defined. 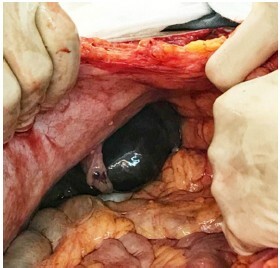 The objective of this case report was to analyze the importance of chemotherapy, salvage surgery and target therapy in the treatment of a patient with refractory OGCT after first-line chemotherapy failure. We reported a 34 year-old woman suffered from advanced refractory MOGCT after first-line chemotherapy, cytoreductive surgery, and a series of chemotherapy. The genetic test shows she is a carrier of EGFR: p.L858R mutation. Based on genetic testing result, she received icotinib which targeted for EGFR mutation, but the tumor progressed. After a secondary cytoreductive surgery, she exhibited a partial response and continued to receive chemotherapy. This suggests that salvage surgery may be considered for patients with persistent or refractory MOGCTs when no effective systemic treatment option is available. Targeted therapies based on gene sequencing may provide a new option; however, its efficacy and related resistance mechanisms still need to be verified by further study.